(15MAY98) This issue will show the relationship between sail force, boat speed and the size of the leeboard (centerboard, daggerboard, keel, etc). In the 1Jun issue I'll look at the effect of the board's aspect ratio on performance, a controversioal subject that needs a lot of explaining. The 9th annual Midwest Homebuiilt Boat Messabout will take place at the Gun Creek Recreation Area at Rend Lake in Southern Illinois on June 13 and 14. Take exit 77W off I-57, head towards the golf course, and you'll see the signs. Lots of folks arrive on Friday and leave early Sunday. Electric hookups at most camp sites and the fee is $8 a night, which includes the ramp fee at this Corps of Engineers facility. There is also a Super Eight motel at nearby Benton. There is no schedule of events. We usually have a pitch-in dinner on Saturday evening. If you plan to attend, drop me a line by the end of May and I'll send you an update. This issue will tell you how to figure the size for the "underwater board" that is used to balance the side loads produced by the sail. By "underwater board" I mean a leeboard or daggerboard or centerboard or fixed fin or keel. I don't see how the exact type makes much difference as far a abililty to counteract side load goes. There are other practical differences of course. As in previous discussions I'll assume the underwater board will counteract all the lateral force of the sail. "But," you might say, "the immersed hull itself provides some lateral resistance." True, but that is usually quite small in proportion to that of a good fin because of aspect ratio considerations that we'll go over in the next issue. You might also ask, "Hey, if you make all the sail's force side force, what's to drive the boat forward?" Correct again, but when close hauled a sail produces mostly lateral force with only a small of forward force left to push the boat forward. It's a vector thing and vectors don't add up like regular numbers. For example if you have 100 pounds of sail force directed 60 degrees off centerline, you would have 50 pounds of force pushing the boat forward and 86 pounds pushing to the side. Assuming all of the sail's force is side force doesn't introduce a huge error. I'm going to use Frolic2 as an example again. Remember in previous issues we worked up a righting moment curve for the boat using the Hullforms6S program we got as freeware at Blue Peter Marine's web page. From there we found that the maximum righting moment for the boat with two big men sitting to windward was 1550 ft pounds. The sail (114 square feet) and leeboard areas are 12 feet apart on Frolic2 so the maximum sail force we can stand without capsize is 129 pounds (which happens in about 15 knots of wind). The force on the leeboard is assumed to be the same as the lateral force of the sail at that time, so the maximum force on the board would be 129 pounds. If it exceeds that the boat will capsize with that crew configuration. How do we size the leeboard such that we can be pretty sure it will produce that 129 pounds of lateral force? The leeboard, or any underwater board, "flies" through the water in the same way that an airplane wing flies through the air. If the board is pointed dead ahead into the flow of water, it produces no lateral force, only drag. If a small "angle of attack" is introduced, a large amount of lateral force can be produced. To produce that angle of attack , skipper need only point the boat slightly upwind of his desired course. So the boat points one way and goes slightly downwind of where it is pointed. You might view this as "leeway". The equation for the lift, or lateral force, developed by the board is F=2.86 x S x C x V x V. It's a lot like the equation used for figuring sail force in the wind. In fact it's exactly the same equation with an allowance that the density of water is about 900 times the desity of air. But there are some other differences. The S in this equation is the area of the underwater board in square feet. Remember it is only the area that is immersed in the water flow. In the case of the underwater board, the value of C is, I would think, less that the C of 1.5 that I recommended for sails. The reason is that the underwater boards cannot have camber, as a soft sail can have, and function through tacking left and right. It must be symmetrical. (OK, boats with two leeboards can have cambered boards.) Thin airfoils with no camber seldom have maximum lift coeffecients much greater than 1. So I recommend the value used for C in this equation be 1. Then the equation reduces to F=2.86 x S x V x V.
V in this case is the boat's speed through the water, not the wind speed. How fast is your boat going to go? Boy, is that a tough question. The speed you want to use in the equation in not the "hull speed", the usual assumed maximum speed of the boat The hull speed (in knots) of a displacement boat is often shown as about 1.3 times the square root of the waterline length (in feet). So the Frolic2, with a waterline length of about 18' would have expect to have a top speed of about 5.5 knots. But the speed we want to use in the equation is about half of that maximum speed. Why? Because for the underwater board, the worst condition is when beating to windward at low speed. 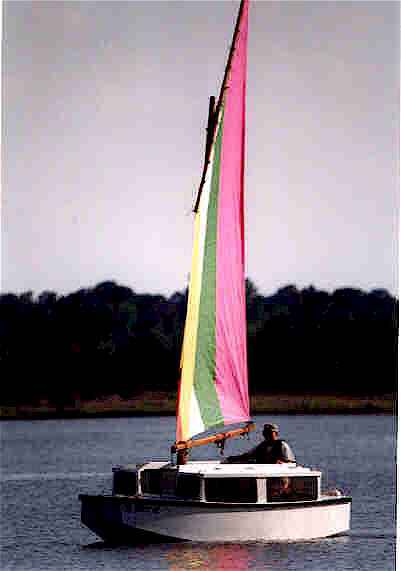 At that time the load on the sail, and thus the load on the leeboard, is maximum, but the boat's speed is well below maximum as it beats through the waves. Let's call this something like "beating speed". So for Frolic2 we might take the beating speed to be 2.75 knots. (It's still pretty fast for a sailboat going to windward.) So now for Frolic2 the equation becomes F=2.86 x S x 2.75 x 2.75. which is equal to F = S x 21.6. If we think the maximum force on the board is going to be 129 pounds as per our stability analysis, we can solve for S = 129/21.6 =6 square feet of leeboard area. Now if you don't like doing math, I'll tell you where I probably got the value of 4.4 square feet when I designed Frolic2. It turns out that if you have a pretty normal boat and make the board area 4% of the sail area, you will probably have something that works quite well. Frolic2 has 114 square feet of sail, so 114 x .04 = 4.6 square feet. I guess that's how I figured it. I do think it is possible to make the fin too big. Certainly you can add a lot of drag by making it huge. The reason I say this is that when I made my Bolger Jinni a long time ago, I used a leeboard that was about 5 feet long. The next season I chopped about 12" off its bottom. Easier to handle. And I can't say I ever really noticed any difference in its performance going to windward. As a contrast to that, I enlarged the leeboard on my Piccup Pram after a couple of seasons and noticed an enjoyable improvement in its ability to sail to windward, especially with the larger sails I had started to use. One interesting thing about the way the board behaves is that if you have two boats with the same rig in the same wind, and one is faster than the other, the faster boat can get by with a smaller board. Why? Because its faster speed through the water produces more pressure on the board than the slow boat. But I don't think you can say something like, "I'm going to increase sail area. That will increase my speed and then I can reduce my board area." It might happen that way if you are lucky. But when you increased the sail area you increased the sail force. And you will need increased board force to balance it. Whether the boat speed increase will sufficicently increase the board force is hard to say. We'll see that not all board areas are created equal. Deep skinny ones can get to a certain value of C a lot sooner (at less angle of attack) than shallow fat ones. Someday I may get to put my full catalog on the net. For now I'll put one design in each issue. The prototype Scram Pram was built by Wil Gordon of Houston, Texas. A second Scram was built to the prototype drawings by Ulric Roberts of Savannah, Georgia. The photos shown here are of Wil's boat. Scram is 16' long and 6' wide where IMB was 14' long and 5'wide. Both boats have a multichine pram shape that I used on my own 11' Piccup Pram. That shape gives lots and lots of volume in a hull that is good in rough water and is fast and handy. Scram displaces 1100 pounds at 7" draft. The sides of the Scram are built up into a Birdwatcher-type cabin, something invented about 15 years ago by Phil Bolger for his Birdwatcher boat. The entire crew sits low inside the boat watching the world through tinted Plexiglass windows, much like sitting in an automobile. Scram's cabin is 8.5' long, 6' wide and 44" deep all in one room. The bulkheads to the bow and stern are open to allow dry storage under the bow and stern decks. There is an open walkway on centerline that is 2' wide. So you can stand up along the center and walk around as in an open boat or sit in the shady sides as in a closed boat. The walkway is easily covered with a snap on cloth in bad weather or storage. This cabin type has many advantages. All boat and sail handling and rigging are done from inside the cabin. There is never need to go on deck. For boating with children I would think it has no equal since the kids are always corralled in the cabin. This cabin also provides the boat with a much wider range of stability than that of a normal unballasted open sailboat. 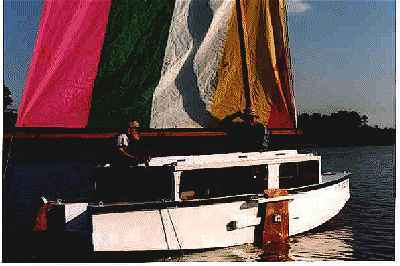 In a knockdown this boat has high sides, decked over roof, and has its crew weight on the boat's bottom, all factors increasing righting ability. In most good weather sailing photos of these boats you will see the crew standing or sitting on the back porch, but in bad weather they would go down into the cabin and steer from there. By the way, the tiller runs under the aft deck into the cockpit with no fancy linkage. Wil wanted a very large sail rig, 173 square feet of balanced lug shown here. He and his wife sewed it up to the instructions given in the plans and they did an excellent job. It's a striped opus that must be seen in color to be appreciated. I always encourage my builders to sew their own sails but I must admit that one of this size might do you in. Some of the seams in the Scram sail are over 20' long so when you feed them through the sewing machine you need an awful lot of floor space. Wil sent a neat photo of the operation in his house, sewing machine in the hallway, room doors open on all ends of the hallway to accept the growing sail. I doubted that Scram needed so much sail but others have told me that in Houston's summer, it will all get used. To balance all that sail and provide steadiness, we gave Scram water ballast tanks that hold about 300 pounds of water. They form a double bottom with a slot down the center for your feet. Filling and emptying are done with simple drain plugs with deck plates directly above the plugs, all done from inside the hull. The tops of the tanks form flats on which to sit. (The Georgia Scram has benches instead with no ballast. Sail area is 150 square feet on that boat.) Wil is experimenting with small valved standpipes set into the tops of the tanks. The idea is to float the boat with the plugs out of the bottoms of the tanks, open the standpipe valves to allow the air to rush out and the water to rush in. When the tanks are full you seal the valves and there you have it - full ballast tanks automatically. I'm not sure if the water will stay there, it might dribble out slowly if you were on a long tack. Testing will show if it works. It's a simple and cheap system. The boat has a kickup rudder and pivoting leeboard. I think Wil ballasted the leeboard with lead to keep it down and then attached a lanyard to lift it up. I've never ballasted the boards on my own boats. I've found they like to stay all the way down or all the way up, not much in between. Nor is there much reason to sail with the board in between. So with an unballasted board the only line I usually run to the board is aft from the eye you see on the top of the board and that line is used to yank the board down after it hits something. Ulric is using an unballasted board with a shock cord to hold it down. Karl James on his Jewelbox used an unballasted board with two lanyards to the board's top, one to lift up and one to pull down. I hesitate to advise a "best" way. There is a small motor well in the stern and another open well in the bow for anchors and such. Construction is taped seam plywood, the bill using five sheets of 1/4" plywood and nine sheets of 3/8" plywood. Only one sheet of tinted Plexiglass is needed for the cabin. It's expensive stuff. I thought the boat would weigh about 500 pounds empty although I suspect the prototype weighs more than that. No jigs or lofting required. Blueprints for Scram are $35. . Anyway..... Anytime a design from the Catalog of Prototypes starts getting built I pull it and replace it with another prototype. So that boat goes into limbo until the builder finishes and sends a test report and a photo. Here are some boats in that catagory (although I been leaving most in the prototypes catalog). Sportdory was not in the prototype catalog very long but there are two well underway. I think both have bogged down a bit as the builders got into the finishing details. Don't forget that sanding and painting usually makes up about half the labor of a boat. Back in the days when I fooled with homemade airplanes the same rule was true. In fact the old timer told me that 85% of the project takes 15% of the time. The last 15% of the work takes 85% of the time. With instant type boats it's not quite that bad. Check out John Bell's progress by clicking here . The Way Up North AF3 project by Herb McLeod (has his own super web page) has been painted and is almost ready to go. Not sure what his total hours are in it but he's put it together in a month or so of spare time. He's going to wait two weeks to let the paint cure well before launching. Not a bad idea. I've never done that but I should have. Get updates on Herb's progress by clicking here. Concerning the Texas IMB that is under construction. Click here to visit Tim Webber's page and see some photos of the IMB as of a few weeks ago. Then poke around Tim's web page a bit. Harmonica (ex Fusebox) is still being fitted out and painted. Plans to have it at the Midwest Messabout. By the way, Tim Webber, who has been sailing the Scram, says the roof of a boat like this must be painted white to be cool in the summer. All of my boats were done that way and I've had no problem. But my own choice is offwhite. Pure white is just too hard on the old eyes in the bright sun.